Sometime in the middle of March, I drove our new old Mercury Villager van to the accident site and parked. Laurie was already there, with a big hunk of (what else?) brownies in her backpack. Jerry soon drove up and parked, as did Vicky, and then Ken with the kids. We were here to clean the site, to help heal the part of the earth that we damaged in our crashing into it. The whole south side of the slope was covered in broken glass and small toys, crayons crushed everywhere. We took plastic and paper bags and carefully crawled around and bent here and there to pick up what we could, trying to separate handfuls of grass from glass. Forest went down to the water, which was low and brown, and he walked through it and over it and generally explored the dimensions of the site. Natalie kept saying that it was a different place, that it couldn’t have been where the accident happened. Daniel, who had to be lulled into driving down this street again and was reluctant to see the site, quickly got into picking up glass and looking around at it. It was the place where we almost died. It was the place that took the impact, took the hit, and let us live. It was mud and grass and slope and stretch of land. It was water and dirt, the eastern edge of the wetlands, all of which were so threatened by another highway that local native people and environmentalists had fended off thus far successfully for two years. It was a beautiful place with great blue herons occasionally flying solo overhead. We picked up all we could, gathered the trash in the back of our van, and then went to a somewhat flat part just cialis generic webmd west of the slope where we had the accident. You could still see the dents in the earth from the van. We gathered hands, the eight of us, and I thanked the earth for saving us, and so did Ken. We all thanked the earth and each other. Then we hugged goodbye, and Laurie walked up the wetlands, around to her home while Jerry and Vicky returned with us to our house to eat the brownies, and other food too, and sit around the kitchen table, putting labels on the annual issue of our bioregional newsletter. Jerry told us the story of when he left the army, simply walked away, and how his life changed in that moment. Vicky spoke about the work she loved and the boss there who made staying with that work intolerable. Both of them told different stories, yet both stories were about leaving what wounds and seeking out what heals. When I hugged them goodbye, and later, stepped outside on the deck alone to look at the cold stars, I thought about the place of the accident, and how what wounds it gave us were actually ways to heal much older, larger wounds, wounds that came from not being part of community, from not having access to the healing tools and energies needed. Wounds that came from being separate from love, not in the middle of it. Then I went back inside to Forest’s room and lifted, from the edge of his bed, the prayer quilt, beautiful in its gold and orange and brown and green, made for him by the church of his great-cousin and name-sake, Ken’s cousin Forrest. I put the quilt on his sleeping body and placed Mariah dog beside him. All of him had come back, and in the process, more of me, lost in ways I can’t remember long ago, returned too. “You two have suffered so much,” a lawyer friend said to me earlier that week. But that wasn’t so true. We had been given this gift of love, this shining spirit of community. The gift of the accident that didn’t take what we loved most but showed us, in stunning clarity, what love looks like as a verb. 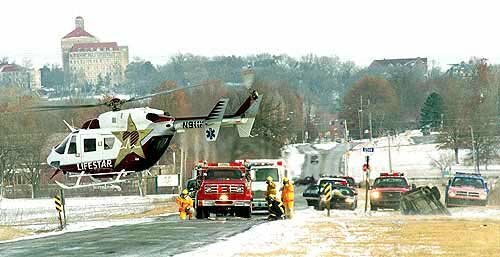 Picture: From The Lawrence Journal-World of Forest being life-flighted from the site of the accident. Note: Some of you reading this will remember the accident. Thank you for all you did to help us then! “what love looks like as a verb”, indeed. What a moving, beautiful post. I remember that day but never saw that photo. Thanks for sharing that memory.